MSS: Is the Taliban training monkeys to fight in Afghanistan? Is the Taliban training monkeys to fight in Afghanistan? Afghanistan's Taliban insurgents are training monkeys to use weapons to attack American troops, according to a recent report by a British-based media agency. Reporters from the media agency spotted and took photos of a few "monkey soldiers" holding AK-47 rifles and Bren light machine guns in the Waziristan tribal region near the border between Pakistan and Afghanistan.... 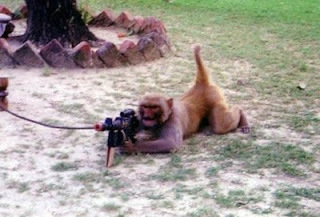 According to the report, American military experts call them "monkey terrorists." ... 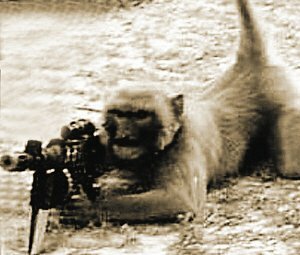 The emergence of "monkey soldiers" is the result of asymmetrical warfare. The United States launched the war in Afghanistan using the world's most advanced weapons such as highly-intelligent robots to detect bombs on roadsides and unmanned aerial vehicles to attack major Taliban targets. In response, the Taliban forces have tried any possible means and figured out a method to train monkeys as "replacement killers" against American troops. The report suggests that the monkey killers will arouse Western animal protectionists to pressure their governments to withdraw troops from Afghanistan and that the CIA trained monkeys to kill in the Vietnam War. What a wonderfully weird, and bogus, story! You can watch CNN's video of the saga here, view some pretty funny comments and images over at fark, but for the best coverage, check out the Taiwan Animated News version below. I can't understand a word of it, but you really don't need to. Make sure you stick it out till the hilarious animation. Ep 135: Why do I sneeze at the Sun?